I decided to meditate yesterday, so I hopped on my bike and took off on the Esplanade alongside the ocean. I always receive my best messages from the Universe when I am outdoors doing some form of physical activity. Yesterday was no different, the peaceful serenity of my surroundings, the ocean breeze and the sweet smell of the sea made for a full on open channel to my intuition. The telepathic communication began to pour in and as it did I recognized there was one word that seemed to stand out in my head, actually it felt like something was shouting it to me. Sorry was the word, it was loud and clear and so was the message that it came with. My feet were peddling slowly, the traffic on the concrete path was light so the atmosphere was calm, the perfect scenario for the Universe to assist me with deciphering it’s intelligence to me. What was brought to my attention was really interesting indeed, because it is something I have been doing here in Australia since I arrived, without any realization of it. The Universe’s message I received actually came as a question, ‘why are you saying sorry so much’? Mmmmm, I gave it some thought as I peddled along. Contemplation is a beautiful thing, especially when you are acting out a form of meditation, stuff in our head can begin to make so much more sense, so my bicycle journey that morning proved to be such a gift. An offering granted by our Higher instinct is a valuable gift most undeniably. 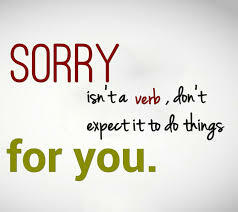 Sorry is a word I very seldom use. I have written blogs about ‘sorry’ before and my sentiments in regards to, so when sorry was highlighted in my intuitive message the Universe had my attention. After several minutes of musing over the question that I was asked (by the Universe), I started to receive some answers. I had in fact been overusing the sorry word and it appeared I would soon understand why. Wow-zers, I was taken by surprise by what intuitively came to me as an explanation. Follow me tomorrow and find out why!